CANAL BIKE RIDE ON OUR 24th. 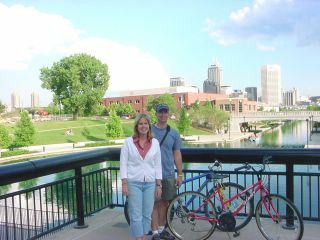 Married in Indianapolis on May 30, 1981, Becky and I enjoyed our 24th wedding anniversary yesterday. We shared an early evening bike ride along the Canal and White River Greenway. We might have taken a gondola ride on the Canal (complete with a serenading violin), but we both would have felt pretty conspicuous.